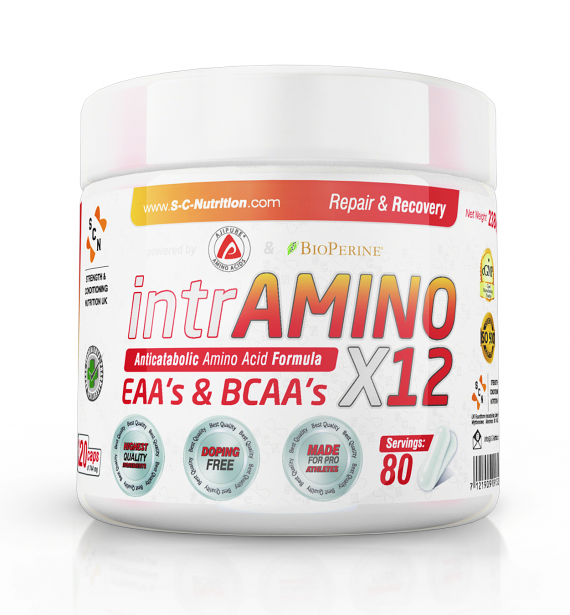 IntrAminos x12 by SCNutrition, is a 12 ingredient amino acid – based supplement powered by Ajipure® amino acids by Ajinomoto®, the highest quality and most effective pharmaceutical grade amino acids ever developed. Using IntrAminos x12 before and in the middle of your training session, you will reduce the catabolic effect of high demanding training or even overtraining. That means that you protect your muscles from being damaged during training and your recovery will be faster and more complete after training. When we talk about aminos, we have to give to our high level athletes the best and the most effective ones, because they deserve it. AJIPURE® – THE HIGHEST PURITY AND MOST EFFECTIVE AMINO ACIDS. AMINOS THAT REALLY WORK! Ajinomoto Co., Inc. has pioneered the development of new and innovative technologies used to manufacture and purify pharmaceutical grade amino acids. AjiPure® amino acids are fermented using only natural vegetable-based carbohydrates as raw materials. Ajipure contains NO raw materials of animal origin in any production process. AjiPure® amino acids stem from over 100 years of clinical and scientific research, yielding unsurpassed quality and purity. Ajinomoto Co., Inc. is the global leader in production, sales and research of amino acids used for medical, pharmaceutical, nutraceutical, sports nutrition and health industries. IntrAminos x12, contain 12 amino acids, both BCAA’s and EAA’s. We have combined the highest quality of pharmaceutical grade amino acids together with vitamin B6, L-Glycine and Bioperine™ so you get the 100% of the amino acids. Glycine is an amino acid that is used for the synthesis of muscle proteins. That means that together with other essential amino acids (EAA’s) and BCAA’s, heals your damaged muscle tissue more complete. Also, several studies shown that L-Glycine reduces protein degradation in a dose-dependent manner. These results indicate that glycine is an anabolic amino acid to enhance protein accretion in muscle cells. Glycine is a physiologically and nutritionally important amino acid for muscle-cell growth. This amino acid, which is deficient in corn- and soybean-based diets, can stimulate protein synthesis and inhibit proteolysis in C2C12 cells. As a functional amino acid, l-glycine holds promise for improving muscle protein accretion. Studies have shown l-glycine to activate the mTOR signaling pathway in C2C12 cells. So, your body, to produce new proteins, needs amino acids as raw material to produce them. The known enzymatic functions of the vitamin B6 group suggests that this vitamin may play an important role in protein metabolism and protein synthesis. IT HAS BEEN DEMONSTRATED that amino acids are absorbed from the small intestine by an “active” as well as passive process. It is also apparent that vitamin B6 plays a role in the active process of cellular uptake of amino acids, and that the antimetabolites deoxypyridoxine and 2,4-dinitrophenol (DNP) have an inhibitory effect upon active absorptive processes. Many research show that amino acid absorption in the upper small intestine of the living, is an active process dependent upon at least one of the B6-vitamin factors. Experimental evidence shows that of the B6 vitamins, plays a huge role in an active (mediated) process in the amino acid absorption. Bioperine is a plant extract derived from two types of pepper plants, namely, long pepper (Piper longum) and black pepper (Piper negrum). The natural chemical compound is a patented product made from the standardized piperine extract from the above mentioned pepper species. BioPerine® from Sabinsa (East Windsor, NJ) is a patented standardized extract from black pepper, containing not less than 95% piperine. Bioperine, is a clinically proven bio availability enhancer for nutrients. It shows increased blood supply to the GI tract, increased emulsifying content of the gut and increased active nutrient transport. According to research conducted by the manufacturer, bioperine substantially increases the absorption of selenium (30%), beta carotene (60%), vitamin B6 (140-250%) as well as coenzyme Q10. Consume 2 servings (8 Vcaps™) 20-30 minutes before training, 2 servings (8 Vcaps™) in the middle of training.